The Foreword by Terrence J. Roberts, PhD. This book is based on the idea that we can develop skills and habits to help us comprehend social issues and particpate in relevant, transparent conversations. Social comprehension, like academic comprehension, is how we make meaning from and mediate our relationship with the world. We understand that the meaning making, or socialization is learned, not inherited. 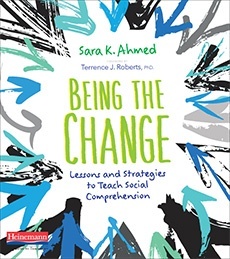 Each chapter in this book includes lessons and/or practical help for students to learn and engage in a targeted social comprehension concept. If we, as educators, are going to be on the front lines of helping children make sense of the news they bring to school and the curriculum the world keeps handing them, we must have a strong foundation of social comprehension in place. If we can commit to approaching this work as the lead learner, teaching with curiosity and modeling vulnerability rather than rigid certainty, we can build habitats of trust where kids (and adults) participate in a learning discussion, and where expression, identity, and social literacy matter.